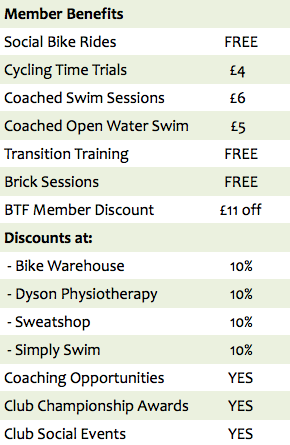 If you’re interested in triathlon and in training with us, please come along and try any of our training sessions. We are very happy for you to train with us for a few sessions before deciding whether to commit to membership. Our membership fees run from April to March, but if you are looking to join Swale Tri Club mid-way through our membership year, please contact us for a pro rata rate. Triathlon specific, periodised swim, run, turbo and circuits sessions, lead by qualified and insured British Triathlon coaches. Weekends training and racing away!